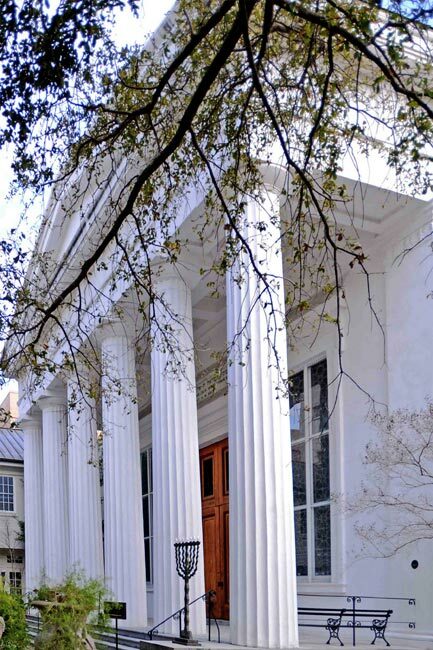 This synagogue in historic Charleston is the second oldest Jewish house of worship in the United States and the oldest in continuous use. (The oldest extant synagogue constructed in the colonies is Touro Synagogue in Newport, Rhode Island.) Charleston was known for religious tolerance, and people of the Jewish faith began emigrating to the Holy City as early as 1695. By 1749 enough Jews were present to form a congregation, which was formally established that year as Kahal Kadosh Beth Elohim. It is among the country’s oldest Jewish congregations. The group initially gathered in private homes for prayers. By 1792 an impressive Georgian structure was completed on this site by contractors Steedman and Horlbeck, making it the largest synagogue in the United States at the time. This grand edifice burned during the Great Fire of 1838, though its wrought iron fence survived. Also remaining from the 1794 building is the dedication stone, which now graces the entrance to the present sanctuary. The destroyed synagogue was soon replaced with this Classical Revival building in 1840. During its construction, an organ was added to the rear balcony, making it the first to be installed in any American synagogue. At the time, the organ was a point of controversy, as organs music was not a component of the traditional Jewish service. However, controversy was nothing new to Beth Elohim. In 1824 a group left the congregation over dissatisfaction with its Sephardic Orthodox practices, instead desiring modified rituals, including prayers and sermons translated into English. This group created the Reformed Society of Israelites. By 1833 the group rejoined the congregation, and the synagogue began practicing in the Reform style. Today the synagogue is credited as the birthplace of Reform Judaism in the United States. (Beth Elohim Synagogue) Kahal Kadosh Beth Elohim possesses national significance as the birthplace, in 1824, of Reform Judaism in America. Originated by German Jews in the early 1800s, the Reform Movement spread rapidly through central Europe and to the United States, where it led to radical changes in Jewish doctrine during the remainder of the 19th century. The influx of German, Austrian, and Bavarian Jews that began in 1836 and continued into the 1890s was a major factor in the success of American Reform. Thus Beth Elohim’s pioneering role is accentuated both because the reform group arose within an Orthodox and mainly Sephardic community and because it antedated the first large-scale Ashkenazic immigration by more than a decade. Congregation Beth Elohim, established in 1749, is the nation’s fourth oldest Jewish community. Its present house of worship, a fine Greek Revival structure, erected in 1840, is the second oldest synagogue extant in the country and the oldest in continuous use. Thank you, Mary Jo! We have clarified that Touro Synagogue is the oldest extant synagogue. We appreciate your comment! Please note that Touro Synagogue was the second, not the first, synagogue constructed in the colonies; Shearith Israel’s original building in lower Manhattan (which no longer exists) predated it by over 30 years.